The storage of audio in digital format (known as audio encoding) requires large amounts of data. For example, storing one second of audio information requires one million bits of data. Optical discs capable of storing billions of bits of data in a very small area were found ideal for such applications. An optical disc can store up to one million bits of data on an area as small as a pinhead. Once the technologies for recording and storing digital audio were found, manufacturers started looking for ways to read and process the data stored in such a small area. Experiments with laser devices (a laser emits a very narrow beam of light capable of focusing on a very small area) proved quite successful. The development of LSI techniques meant that the huge amount of data stored on the disc could be processed fast enough to provide continuous music. The stage was now set for the development of a complete compact disc system. A compact disc is a 4.75 inch-diameter (12.065 centimeters) polycarbonate plastic disc containing approximately 74 minutes of audio information. Not all the information on the disc is music; some of it is used for error detection, synchronization, and display purposes. Information on a CD is encoded on a spiral track in the form of indentations called lands and pits that represent binary highs and lows. It is these indentations that the CD player's laser "reads." Conceptually, the design of a CD player resembles that of a phonograph (record) player. Like a record, the compact disc is rotated on a turntable, and the audio is read by a pick-up device. However, unlike a record player, the motor does not rotate the turntable at a constant speed but adjusts it in accordance with the distance of the pick-up from the center of the turntable. Furthermore, the pick-up device in a CD player is not a mechanical stylus (a needle) but an optical laser beam that does not come into physical contact with the compact disc. This laser focuses its beam on the disc track that contains the lands and pits, and the CD player's detector (the photodiode) senses the difference between the light reflected from the lands and that reflected by the pits. The photodiode turns this reflected light into an electrical signal. Relayed to the electronic circuit board, this signal is then converted back to sound. The electronic circuit board assembly consists of printed circuit boards that contain the circuitry for the servo mechanism, which operates the optical pick-up system, data decoding, and control system. There are many integrated circuits chips, microprocessors, and large scale integrated components on the board assembly. 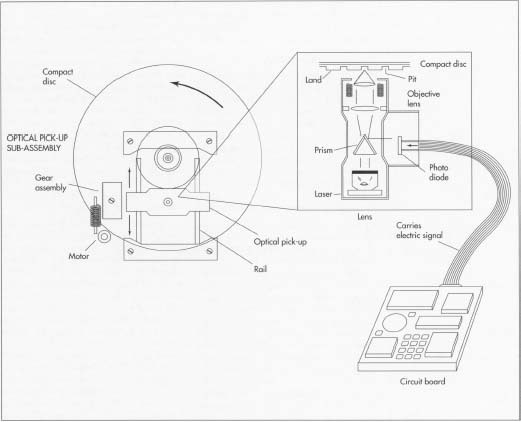 A key assembly in a compact disc player is the optical pick-up assembly. It is situated on rails so that it can move back and forth underneath the compact disc. It works by directing a laser beam at the CD; if the laser hits a land, the reflected light then travels to the photodiode, which generates an electrical signal. In turn, the signal moves to the CD player's circuit board, which converts the signal into music. In today's manufacturing environment there is no single method of manufacture and assembly. Products are increasingly made as subassemblies and brought together as larger subassemblies or as the final product. Robotics and computer run lines allow for virtually any part to be installed in any state of the subassembly at any point in the process. The sequence can be changed in minutes to allow for modifications or quality control check points. The manufacturing process detailed here, therefore, follows a similar approach to the actual manufacturing process used in the industry. The process is first described in terms of the various subassemblies and then the description details how the various subassemblies are brought together to make the final product. 2 Next, the motor that will move the optical pick-up is connected to the gears and belt and placed on the chassis. The loading tray is now centered, and the spindle motor that will rotate the disc is installed. After the clamp to which the optical pick-up has been attached is positioned adjacent to the loading tray, the tray, clamp, and pick-up motor are installed in the loading drawer, which is placed in the CD player's cabinet. 3 Last to be assembled are the electronic components. Designed by engineers using computer-aided design (CAD) packages, the circuit boards consist of a copper-clad base that has a pattern transferred onto it (masking) through screen printing or a similar method. After being coated with a photosensitive material, the patterned areas are etched away chemically to create a multi-layered board—the layers comprise the various transistors and capacitors that make up the circuits. The tiny microchips (usually made of silicon) that are mounted on the board are made in the same way, except on a much smaller scale. 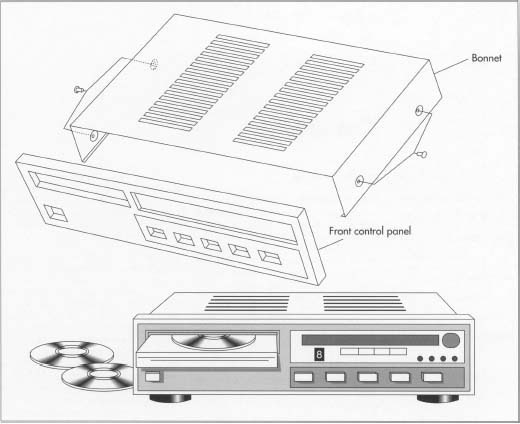 Depending on the manufacturer, the CD player may have one large circuit board or several smaller boards. After they have been attached to the panel or panels, the circuits are attached to the CD player's front control panel, the switch assembly, and finally the power supply. Because so many of the components in a compact disc player are made by specialized vendors, the player manufacturer must depend on these vendors to produce quality parts. Some of the most crucial elements are those in the optical pick-up assembly. The lenses and mirrors used in the laser pick-up, for instance, are made of high quality glass, and human contact must be avoided during the manufacturing process to keep their surfaces clean and smudge free. Similarly, the electronic circuit components must be made in a "clean room" environment (containing special air filters as well as clothing requirements), because even a single dust particle can cause malfunctioning in the circuitry. The circuit boards and chips are tested at many levels by diagnostic machines to pinpoint faults in the circuits. The CD system technology has come a long way in the last few years, and new applications for compact disc systems are being discovered every day. The market has already seen the introduction of CD-ROMs, CD-Videos and CD-Interactive. The latest product to attract consumer attention is Kodak's Photo-CD, which can display photographs on television and computer screens. These pictures can be edited or cropped by the user, just like clip art images. The housing for a CD player includes a top cover or "bonnet' and a front control panel. The compact disc rests on a loading tray that slides in and out of the player. These functions will allow the user to display information on the remote control unit itself, such as song titles, artist names, and the actual lyrics of the songs. Compact discs capable of both recording and playback, like a cassette tape, are also in the works. The CD's vast storage capabilities also lend itself to many broad-based multimedia applications, and it is quite possible that compact discs will become the common medium of data exchange for all audio, video, and computer applications. Matzkin, Jonathan, Rock Miller, Gayle C. Ehrenman, et al. "CD-ROM Drives: Finally Up to Speed," PC Magazine. October 29, 1991, p. 283. Ranada, David. "Loose Bits," High Fidelity. March, 1986, p. 22. Shah, Prasanna. "Music of the Bitstream," Audio. January, 1991, p. 56.